We live in an increasingly busy and demanding world. Nearly everywhere we go we are bombarded by noise – and your pupils may have the additional experience of having to share a bedroom with siblings – they “may never have a moment to themselves”. This means that being quiet and stopping to think may be challenging, even uncomfortable, for some children (and for older people too). Your school can give people the opportunity, and gift, to still and to be still. By providing reflective spaces in school, and encouraging people to use them, you are signalling that it is right to ask big questions and seek answers, to develop a sense of wonder about the universe, to explore the dimensions of the spirit, and, yes, to just be. A reflective corner or prayer space can be placed anywhere where it is both accessible, but also not so tucked away that it becomes a hiding place. Where schools have no such “helpful corners” a reflective board or big question board will serve the same purpose. 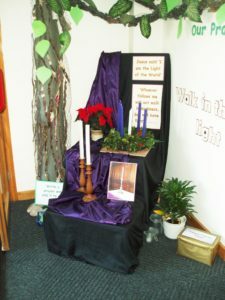 In the main collective worship area in the hall it is probably best to think in terms of a focal wall, connected with the worship itself – but the school entrance hall and corridors can be used as interactive areas to pause and reflect, and classroom spaces can have specific areas for reflection and quiet thought. The space does not need to be elaborate – but it does need to be accessible and offer a focus. Here are some questions to ask about designing reflective spaces in your school – the same questions can also be adapted to ask what impact already existing spaces are having, as a space which becomes “wallpaper” is not fulfilling its original purpose! What opportunities do we currently give for reflection? Where could reflective space be developed in the school? E.g.. the hall/corridors/classrooms? Who are the intended users of this space? How will the space be used? Will it be open access? How will it be supervised? If children wish to linger there, will it be comfortable? How is the place and space created? Whose ideas? Governors? Head teacher? Staff? Children? Clergy? Who is responsible for looking after the space and putting the ideas into practice? How will it be funded? Is it a permanent feature? How often should the content be changed? 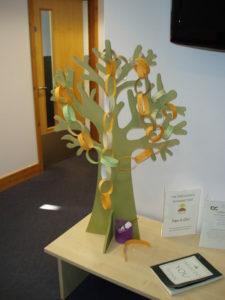 Should it link to other areas of school life e.g. our values or our collective worship programme? Will it always have an obvious Christian theme or should there be a variety of stimuli? How will the space be introduced to the children? How can they be encouraged to use it? Will it need to be re-introduced each time a theme changes? Does the space encourage interaction? Does the space engage the senses and the imagination? Will it appeal to all kinds of learners? 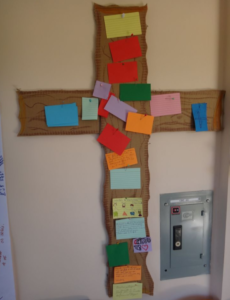 You may find the Prayer Spaces in Schools website helpful http://www.prayerspacesinschools.com/ It is designed for churches working with schools and has helpful resource ideas.